A center in Windham uses horseback riding to improve the lives of clients with disabilities. WINDHAM — Missy said the exercises are difficult, but she did them, stretching back and forth while sitting in a saddle atop Duke, a tall, easygoing quarterhorse. As Duke moved around the arena, eventually breaking into a trot, Missy maintained her balance – no small effort for someone with a seizure disorder and mild cerebral palsy. Following Duke in the indoor arena was Dan, a spotted draft horse. Atop Dan was Paul, sitting straight up in the saddle – quite a contrast from 20 minutes earlier when Paul arrived, slumped in his wheelchair. Soon enough, Dan was trotting with Paul, too. 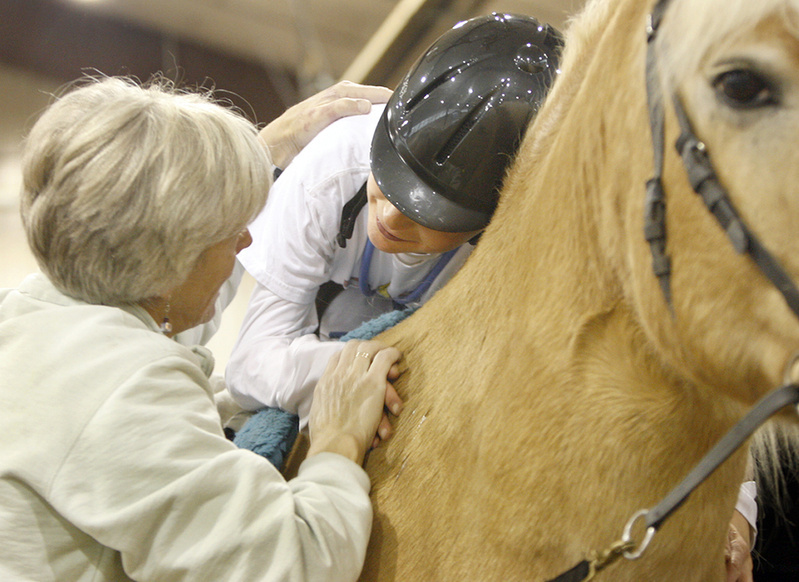 Here, among the back roads of rural Windham, a remarkable combination of therapies – physical, cognitive and emotional – is taking place, with the help of instructors, volunteers and horses. 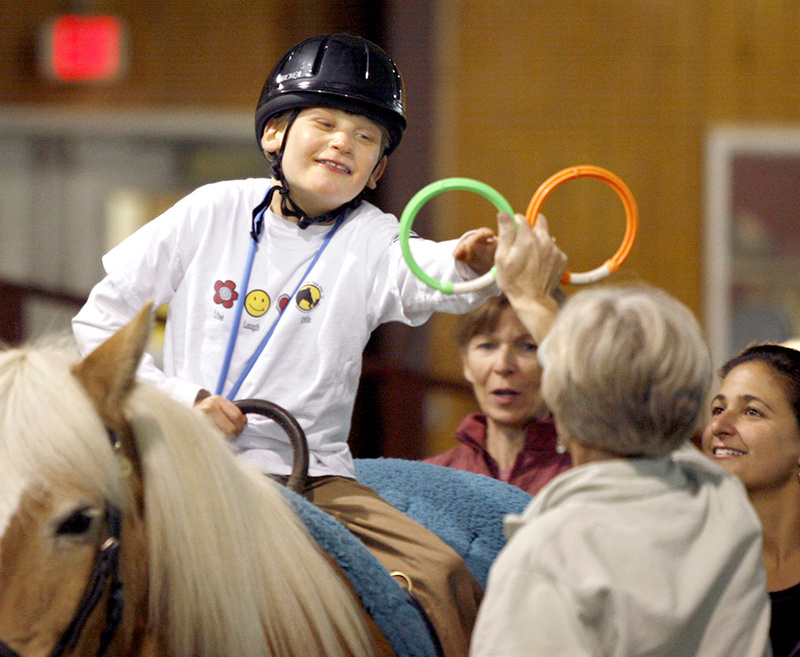 Riding to the Top Therapeutic Riding Center is the largest such center in northern New England. Using horses in therapy is not new. Historical records throughout the previous century show, for example, that Great Britain offered riding therapy for soldiers wounded in World War I. In 1969, the North American Riding for the Handicapped Association was founded. Riding to the Top began in 1993 at Pineland Farms in New Gloucester. The current 50-acre location in Windham was purchased in 1998. 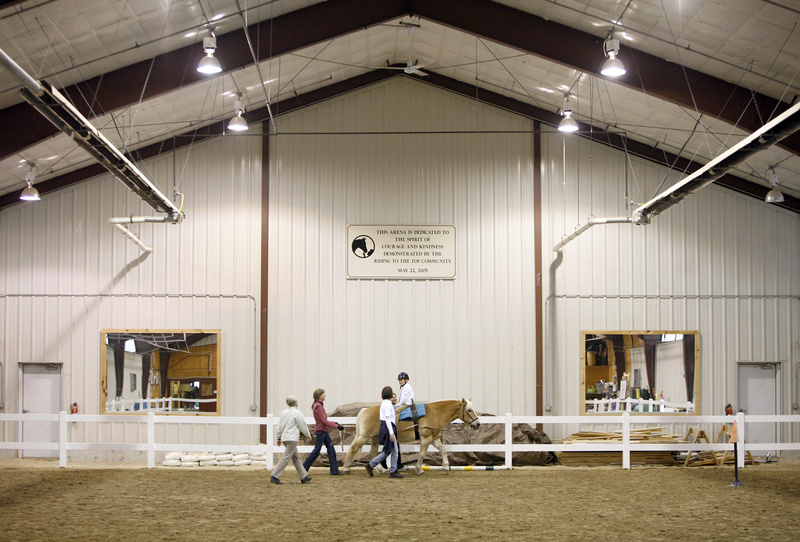 With an indoor arena, the center is open year-round. Lisa Wentzell’s son Scotty has Dubowitz syndrome, a very rare (fewer than 200 cases worldwide) genetic disorder that affects brain cognition and physical development. Wentzell heard about Riding to the Top from another parent when Scotty was 4 years old. While riding, Scotty’s strength and coordination improved. Until he was 7 years old, Scotty could not walk. He took his first steps while at the stable. Now 10, he doesn’t miss a session, riding Luke, a Haflinger. Diagnoses for the 250 clients ages 3 to 73 who visit Riding to the Top in a year include autism, cerebral palsy, stroke, brain injuries, Down syndrome, behavioral and emotional disorders and learning disabilities. More and more special education groups from local schools are visiting. Kids who have trouble focusing in class pay attention when they are mounted on a 1,000-pound horse. Bronson grew up riding horses on a farm in western Connecticut. She graduated from Bowdoin College in Brunswick and then received her master’s degree in physical therapy from Duke University. While at Duke, she volunteered at a therapeutic horseback riding program. She immediately saw the connection between horses and physical therapy. Not only were clients strengthening muscles and improving coordination, they were more attentive and more engaged. “You can get kids and adults to focus on activities that (normally they can’t) if they were just sitting. On a horse, they have to stay balanced,” she said. Volunteers lead the horses and also walk (or trot) alongside the riders, ensuring safety. Clients are encouraged to address the instructors, volunteers and each other. “For kids with disabilities, there tends to be a lot of isolation,” Bronson said. “Other kids don’t relate to them well. People assume if they cannot talk, they don’t understand. Linda Baker, a special education teacher at King Middle School in Portland, learned of Riding to the Top from a parent of one of her students. She brought 12 students – only one of whom had riding experience – to the center. “They were hooked from the first day. It really boosted their self-esteem,” Baker said. And there were more positives that Baker noticed. “It had an effect on their academics,” she said. “They’re reluctant writers. But this just opened them up. For the first time, I got them to write a full page about their experience – because they had a great experience to write about.